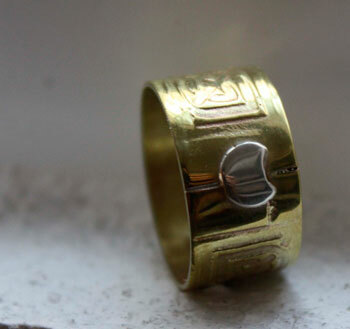 Brass is a metal that is quite present among our favorite jewels, and more particularly for etched jewelry. The result is far way more beautiful than copper. Brass is a mix of copper and zinc but according to the properties you are looking for, it can be mixed with lead, pewter, nickel, chrome or magnesium. This is why there are different types of brass. The word brass comes from the Arabian word Latun which means "copper". This same word would also derive from the Turkish Altun, meaning "gold". The English word brass comes from the old English word Braes, meaning bronze. In both cases, like in many other translations, the story of the word "brass" is difficult to understand and is still mysterious. Brass does oxide in the long run because it is in contact with the air. It shows a layer called vert-de-gris. It can be sometimes found under the names of yellow copper, tombac, archal, Florentine bronze or Venetian bronze, similor or pinchbeck. The presence of copper in brass transforms it in a germicidal metal. Therefore, it kills microorganisms within a few minutes or after being exposed to it for a few hours. Brass has been known since the prehistoric period in almost every part of the world. But it has only been since the Middle-Ages that we understood its alloy. The method to make brass dates back to the Roman period. Zinc started to be properly identified and mined, sometimes accidentally, to make brass. Before, people would look for a copper ore rich in zinc to get brass. In the last part of the first millenary B.C., the use of brass would go from England to Spain and from Iran to India. The quantity of brass was good enough to be used as coins in the 1st century A.C, first in Phrygia and Bithynia, and then all over the Roman Empire. The brass production decreased a lot when the Roman Empire declined, as well as during the medieval period. It remained fashionable in the East of Europe but not so much in the West. Brass was quite popular in the Islamic world and a lot of new production techniques were invented. After the medieval period, brass comes back and is produced at a large scale in Europe, especially thanks to new means of production. It was often used instead of gold or silver for decoration before America was discovered. Brass was quite important in Africa as were other mixed metals. It was more precious there than for European minds. One of the most remarkable tribe for its metal work was the Yorubas from the Ife kingdom in Nigeria. This civilization particularly bloomed between the 12th century and the 14th century. They made a very rich sculpture work by using brass. It was then the turn of the kingdom of Benin who became especially famous for the sculpture of brass sheets and masks. Thanks to the presence of copper, it would be good for skeleton problems. It would help eliminating toxins in the body.